Looking for effective treatment and advice on how to alleviate the symptoms of rosacea at home? Try a free consultation with our Online Doctor to see what creams, medications or treatments would be suitable for you. We offer the best prices and fast, discreet UK delivery. Get rid of the breakouts, rashes and discomfort caused by rosacea and buy your treatment from The Independent Pharmacy today. It isn’t fully understood what exactly causes rosacea. There are a number of possible factors that have been suggested. It is believed by some experts that rosacea is caused by a blood vessel abnormality. However, what causes this particular abnormality is still unknown. More recent research has suggested that the external triggers of rosacea can lead to the activation of molecules in the skin known as peptides. Having excess levels of peptides in the skin can activate both the immune and neurovascular systems of the skin. This activation can cause the blood vessels to dilate, resulting in redness and inflammation. Another possible cause are microscopic mites called demodex folliculorum. These mite usually reside harmlessly on human skin. Sufferers of rosacea present with higher numbers of these mites and research suggests rosacea can be caused by the skin’s reaction to the bacteria found in the mite’s faeces. Alternatively, a current theory suggests that a bacteria found in the digestive system, helicobacter pylori bacteria, is the cause of rosacea. This theory argues that helicobacter pylori stimulates the production of a protein called bradykinin. This protein is known to cause blood vessels to expand and hence cause the effects of rosacea. It is apparent that rosacea is more common in families. This could suggest a genetic cause of the condition. However, it is not clear which genes are involved or how the condition is passed on. The main and most common symptom of rosacea is facial flushing. This is characterised by the skin turning red for short periods-usually only a few minutes. This flushing will mainly affect the face but in some instances the neck and chest can be affected as well. 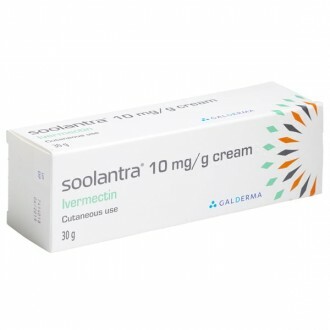 Some sufferers experience an uncomfortable heat sensation that accompanies this skin reddening. Some sufferers are affected by a persistent facial redness that resembles a patch of sunburn that does not subside. This form of rosacea is known as erythema and it usually affects the nose, cheeks and chin. In some cases erythema can spread to the forehead, neck and chest. Another visible symptom of rosacea can include permanently widened blood vessels. These vessels have dilated over time and will be visible on the skin. This is known as telangiectasia. Someone with rosacea can develop papules and pustules. A papule is a round red bump that protrudes from the skin. A pustule is a pus-filled swelling. These will mainly appear on the face and can resemble the symptoms of acne. However, rosacea and acne are unrelated conditions. Unlike acne, rosacea does not potentially damage the skin or cause any scarring. In more severe cases of rosacea the skin can thicken, causing the sufferer to experience a buildup of excess tissue. This tissue usually forms around the nose causing it to become enlarged and bulbous. This symptom will take years to develop and is not that common. This thickening of the skin is called rhinophyma and tends to affect more men than women. Rosacea can, in some cases, affect the eyes as well. This is known as ocular rosacea and symptoms can include; dry, irritated or bloodshot eyes, inflammation of the eyelids and feeling as though there is something in your eyes. If ocular rosacea starts to cause any pain in the eye, blurred vision or a sensitivity to light then it is recommended to seek medical advice immediately. Lymphoedema: A swelling of the face. Sensitive skin that can include; burning, stinging, itching and pain. Unfortunately, rosacea doesn’t have a cure. However, there are treatments available designed to keep the symptoms under control. The type of treatment will depend on the symptoms you are presenting with, it may just involve self-help techniques or these techniques combined with medicinal treatment. If your rosacea has caused papules and pustules to develop then there are various different treatments that can be effective. The first line of treatment will usually be a topical gel or cream. 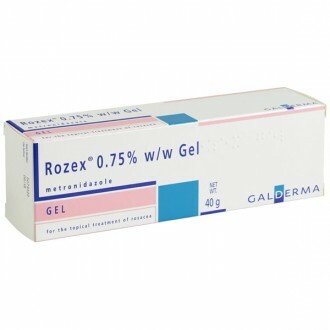 The two topical treatments most often prescribed are Metronidazole (Rozex Gel), Ivermectin (Soolantra Cream) and Azelaic Acid (Finacea Gel). 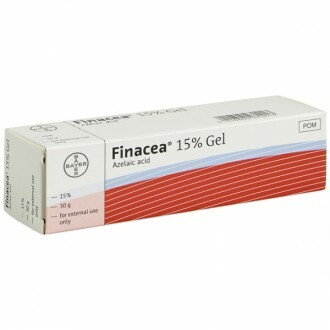 Treatments such as Finacea and Rozex are usually applied once or twice daily to the affected area. 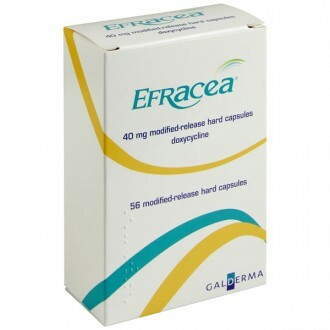 If Finacea and Rozex have proved ineffective then a 6 - 12 week course of oral antibiotics (Erythromycin or Efracea) may be necessary. Treating facial redness in rosacea can prove more difficult to treat than papules and pustules. 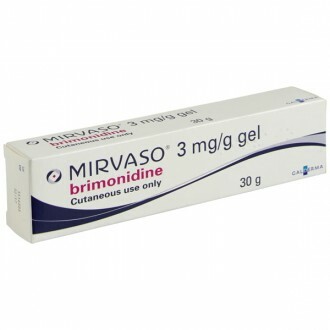 Brimonidine Tartrate (Mirvaso Gel) is a topical gel treatment that works by restricting the dilation of the blood vessels in the face. Research shows it can have an effect in as little as 30 minutes after application. Once applied the effects of Mirvaso Gel can last for up to twelve hours. For information regarding self-help techniques for preventing and treating rosacea, see 'Prevention' below. Treating thickened skin (rhinophyma) will require referral to a dermatologist or plastic surgeon. There are a number of surgical treatments available that can remove the excess tissue from the nose. Treating ocular rosacea may require lubricating eye drops or oral antibiotics from your GP. If these prove ineffective then you will need to be referred to an ophthalmologist for further testing and treatment. Avoiding known triggers: For example, if you know hot baths trigger your rosacea then try reducing the water’s temperature or have a cooler shower instead. If sunlight makes your symptoms worse then reduce exposure by covering the skin or by using a sensitive, high SPF sunscreen. Stress is a very common trigger of rosacea. By managing your stress levels you can help reduce the chance of an outbreak. Looking after your skin: Cleanse and moisturise your skin using non-irritant, hypoallergenic products designed for sensitive skin. It is recommended to avoid astringent toners and products that contain ingredients that can cause irritation to the skin. Known irritants include; fragrances, alcohol, menthol, lanolin, clove oil, witch hazel, eucalyptus oil, sodium lauryl sulphate and camphor. For men, switching to an electric razor has been shown to reduce skin irritation. Using camouflage make-up: If suffering with persistent red skin then using suitable make-up products will help to conceal these patches. Your GP or specialist can refer you to a skin camouflage service or directly prescribe skin camouflage products. Keeping your eye lids clean: If rosacea is known to affect you eyelids then ensure they are kept clean. This will help reduce any inflammation or irritation. If using eye make-up, it is recommended to select a product that is mild and washes off easily. Consider any lifestyle changes that can trigger your Rosacea flareups. Keeping a diary may help. Rosacea is a skin condition without a precise known cause. Facial skin can become red when blood vessels near the outer layer of skin expand more easily than normal. This can be caused by a number of external factors related to your lifestyle and environment, called rosacea triggers. There is no evidence to suggest that rosacea is contagious. Though antibiotics are often effective in relieving symptoms, this is not because rosacea relies on bacteria. Instead, it is due to the anti-inflammatory properties of antibiotic medicines. Is Rosacea a genetic disorder? There is some evidence which points to rosacea being hereditary – two in five people with rosacea also have a close relative who exhibit the same symptoms. No scientific research has proven the genetic link, though a recent study has suggested that genetic and environmental factors contribute an equal amount to whether or not an individual will develop rosacea. Is it possible to diagnose Rosacea in advance of a major episode? Some teenagers and young adults experience redness of the cheeks, forehead or nose that goes beyond what is normal for regular acne. When acne treatments are ineffective or cause irritation, it might be a case of “prerosacea”. Once these symptoms are recognised, young people can learn to avoid lifestyle choices and environmental factors which might trigger rosacea in future. Anyone exhibiting these symptoms should speak with a dermatologist for this reason. Can I determine whether I have Rosacea by myself? There is no reliable self-diagnosis for rosacea. A doctor must make this assessment after considering your medical history and present symptoms. You should disclose to your GP any abnormalities you have noticed around the face – this includes any redness, swelling, itching, or other relevant symptoms. Does Rosacea worsen with age? Without treatment, rosacea will tend to worsen with time. It remains impossible to accurately predict how a particular case will progress, but the correct medication and lifestyle changes have shown to be reliable at suppressing rosacea symptoms in the long term. How long will my Rosacea last for? There is currently no cure for rosacea, so it is a chronic skin disorder. Patients will experience recurrences and remissions; however, these relapses will become less frequent and severe in the long term following sustained treatment and lifestyle changes. Is it easy to find a Rosacea specialist? There are no specialists who are uniquely devoted to rosacea. You will need to see a dermatologist for symptoms of the skin, or possibly an ophthalmologist if symptoms are affecting your eyes. Contact us and we will help you find the right dermatologist for you. Children very rarely exhibit rosacea, though some such cases do exist. As it often affects multiple people within a family, people with rosacea should be wary of prerosacea symptoms in their children. If these signs are diagnosed early, the appropriate lifestyle changes can be made to prevent the condition from developing fully. Common symptoms of rosacea include burning, stinging and itching sensations. This can extend to facial swelling, which can be present from the onset of the disorder. This is most often noticed in the cheeks. Some patients exhibit a slightly enlarged nose as a result of this swelling. Are these symptoms usually symmetrical? Many patients do experience symmetrical symptoms, but others will have symptoms which vary in severity over different sections of skin. In some cases, rosacea seems to begin at one point of the face and spread from there. Is it abnormal to have both Rosacea and common Acne? Though rosacea and acne occur independently, some patients will experience both at the same time. Whereas rosacea is related to the blood vessels just underneath the skin, acne is caused by pores on the surface of the skin being blocked. Unlike rosacea, acne also commonly affects areas outside the face, including the back and shoulders. Because these are two different conditions, distinct treatments will be required for each. Some acne treatments have been shown to cause rosacea to worsen. For this reason, special discretion must be taken when attempting to treat both disorders at once. Is it normal that my skin is dry and flaky? Dry skin will occur in about half of all cases of rosacea. When other symptoms go into remission, skin will often stop flaking as well. If you experience dry skin, apply a moisturiser along with your daily routine of rosacea medication. Different medications will have different moisturising effects, so you should ensure with a dermatologist that yours is appropriate for your skin type. Is it normal that my skin is oily? Though many patients experience dry skin, oily skin is not an abnormal symptom. Again, you should ensure that your medication is appropriate for your skin type. Is Rosacea linked to Seborrheic Dermatitis? Patients with seborrhea will notice scaly lesions near the centre of the face, or an increase in flakiness on the scalp, beard or eyebrows. It is not uncommon to show symptoms of both rosacea and seborrheic dermatitis. Is Rosacea linked to Eczema? Though eczema and rosacea have similar symptoms, there is no connection between the two. Eczema is more common in people who already have dry skin, and can manifest on many different parts of the body beyond the face. Will Rosacea increase my risk of developing skin cancer? There is no proven connection between rosacea and skin cancer. However, those with rosacea often have quite light skin, to begin with, and so are already the most susceptible to cancer caused by ultraviolet radiation. It seems that Rosacea medication has caused spider veins to develop on my face. Is this normal? This is very common – it is more likely that these visible blood vessels were always present, but were less visible whilst rosacea was causing your skin to flush. These veins can either be covered with makeup, or removed with laser treatment. Can Rosacea manifest on parts of the body other than the face? Rosacea has been known to sometimes appear on the neck, chest or back. However, this is quite uncommon. How does Menopause effect Rosacea? Women going through menopause often experience hot flushes. These have been known to trigger rosacea, and in some cases cause an initial onset. Rosacea around the eyes can cause burning, itching or stinging of the eyes, as well as a bloodshot appearance. This is called ocular rosacea. It can also cause styes to develop around the eyelid. If untreated, ocular rosacea can cause vision problems due to the irritation of the cornea. If you notice symptoms of ocular rosacea, consider consulting an ophthalmologist or dermatologist. They will advise the appropriate treatment for the eyes and help prevent symptoms from spreading to the skin. Which external factors can cause Rosacea to flare up? Will these triggers cause Rosacea to flare up immediately? The time that rosacea takes to flare up will vary depending on the type of trigger and on the patient. Try to notice how long the flare-up takes so that you have an estimate for future triggers. Is there a connection between Rosacea and Allergies? Allergic reactions can manifest in a flushing of the skin, which can then trigger rosacea to flare up. You should be aware of what causes you allergic reactions so that you can avoid rosacea relapses as well. What effect does exercise have on Rosacea? Why have I been prescribed antibiotics for my Rosacea? Rosacea is not a bacterial disorder. However, antibiotics also have anti-inflammatory effects, which have shown to be useful for treating rosacea episodes. Will antibiotics lead to a bacterial resistance? With the types of antibiotics that you will be prescribed for rosacea, only a very small amount will enter the bloodstream. 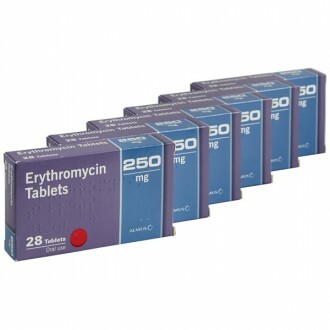 Therefore, there is no significant risk of the medication leading to a bacterial resistance elsewhere in the body. Do I continue taking antibiotics after a flare-up goes away? Like many skin disorders, rosacea involves recurrences and remissions. Antibiotics have been shown both to increase the rate of remission and to prevent recurrences when used consistently in the long term. Therefore, it is advised to continue your treatment in order to prevent flare-ups from recurring. Will my medication remain effective in the long term? Antibiotic creams will maintain their effectiveness in the long term. What are the best ways to care for my skin? Dermatologists recommend a gentle yet thorough daily cleaning routine for patients with rosacea. Soft soap and washcloths should be used – try to avoid anything coarse or abrasive. Give the face a lukewarm rinse. Gently blot the face with a towel to dry it. The face should be completely dry before the antibiotic cream is applied. The medication should be allowed a further ten minutes to take affect before the use of any other skin care or cosmetic products. Which skincare products should I be using? People with rosacea are likely to have sensitive skin, and so should avoid any creams that might cause burning or irritation. More specifically, common ingredients that might cause irritation include alcohol, peppermint, menthol, eucalyptus oil, salicylic acid and witch hazel. Exposure to the sun may trigger rosacea flare-ups, so it is important to use sunscreens with SPF of 15 or higher, which will protect against the full range of ultraviolet radiation. If common sunscreens cause you skin irritation, alternatives include physical blocks which use zinc or titanium dioxide. How long do rosacea treatments take to work? This completely depends on which treatment you choose, and varies from person to person. You can expect your symptoms to ease within a few months, though it can take longer. If your symptoms are not getting better, consult your doctor to review your treatment plan. What are the similarities between the symptoms of acne and rosacea? Acne and rosacea can look similar in appearance, with sore, raised, red rashes with papular and pustular breakouts. Rosacea is sometimes called ‘acne rosacea’, which can often confuse people. They are two completely different conditions. Rosacea, featuring burst blood vessels, is often mistaken for pimples, particularly in the early stages. The later stages of rosacea can feature large, raised lumps on the skin, which can also be mistaken for acne. Can rosacea be caused or cured by changes in diet? Rosacea can be caused by food allergies. An allergic reaction may include congestion, flushing of the ears and cheeks, and a reddened nose. Many people believe that a diet consisting of low-sugar fruits with a high amount of vitamin C, like berries, can help improve Rosacea. Some dieticians will also advise avoiding inflammatory foods such as alcohol, coffee, beef, pork, lamb and dairy products. Are there any effective natural remedies as quick fix or cure for rosacea? Many natural supplements and remedies are used to treat rosacea at home. These include turmeric, aloe vera gel, raw honey, ginger, and essential oils. These can be used alongside prescribed treatment. However, if you seek a cure for your rosacea, you should seek medical help rather than rely on natural treatments. Is rosacea ever caused by makeup? To prevent irritation of the skin, you should cleanse and moisturise with non-comedogenic products. It is advisable to use non-oil based makeup to prevent further irritation of the skin and blocked pores. There are a number of mild and mineral-based cosmetics on the market that are tailored to sensitive skin. Over cleansing your face or using harsh products can further irritate the condition. Be sure to use mild or natural products that soothe, rather than aggravate, the surface of the skin.